Each local permaculture group is running its own Permablitzes in a energy efficient local community/capital building fashion. I can’t emphasise enough the importance of, and support you will get, in joining a local permaculture group in your area. Membership to PermacultureWest is $30 per annum (waged), $10 concession. Join us so you can be a part of this growing and thriving hub of sustainability and local community groups in WA. New local groups are popping up, so if one is not near enough to you but you would like to be part of one or help start one, please let us know. Find your local group. Permablitzes help people get together and have fun learning about, designing, and creating suburban permaculture systems. Our focus is edible gardens and our ultimate aim is to make the suburbs social and edible, so that if food ever became unaffordable, you wouldn’t even notice. At a Permablitz you’re learning by doing, whilst getting ideas for your own garden, participating in free workshops, meeting good people, helping to reduce food miles and water use, beautifying underused spaces, sharing resources, eating great food, and preparing the way for healthier, tastier food, while building community networks and urban resilience. And what does all this cost you? Nothing! And if you attend three or so blitzes we can help organise one at your house! There will be a brief introduction in which the design for the day, and the ideas behind it, will be explained and then we’ll get to work. 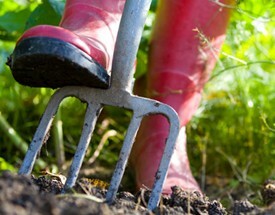 You’ll be shown what to do and be working with others, in teams, on various projects in the garden. Teams can rotate so you can get some hands on experience in all the different projects, and there will be short workshops throughout the day on a variety of topics. The hosts will provide a shared lunch for the workers. Bring something if you would like to share, but you don’t have to. By about four o’clock we’ll break and thank everyone. By then, quite a transformation should have taken place! You’ll hopefully go home brimming with ideas, having met lots of wonderful people, having had a taste of permaculture design and having been learning by doing. Would you like to run a Permablitz in your area? Or start a network to keep running them? It’s remarkable how much positive energy you can engage with a tiny bit of organising. Anyone can do it with the right energy and attitude. We would love to see everyday people rolling out edible permaculture gardens in the suburbs. Contact us for some help to get started. If you’re someone who has completed your Permaculture Design Certificate and you’d like some hands on practice, get in touch with us and you can help to run a blitz or even organise your own!